Kasienka and her mother arrive in Coventry from Poland with barely a bag between them. They have left everything behind (which wasn’t much, anyway) to come in search of Kasienka’s wayward father. He’s set up a new life here, and Kasienka’s mother fully expects them to just fit right back into their old roles within it. But she’s wrong. Whilst her mother continues to search for her lost husband, Kasienka must go to school. But it’s hard to fit into a teenage world where you don’t understand any of the silly little rules, and where being different carries little in the way of cultural capital. Swimming, however, makes everything better. 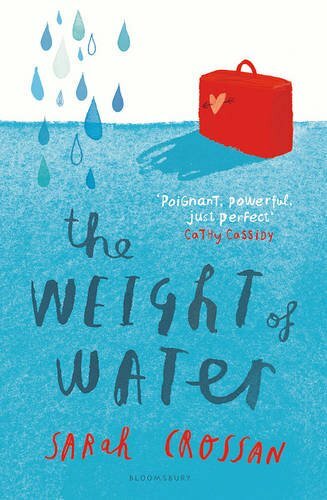 She doesn’t need to speak the same language (and not just in the literal sense) beneath the surface of the water – and that’s how she meets William, who inadvertently teaches her why her mother has dragged her across the continent in pursuit of a man she is besotted with. As with the wonderful One, and her double-hander with Brian Conaghan, We Come Apart, Sarah Crossan’s novel is written in blank verse, with snatches of lyricism doing the job of a chapter of prose. The novel dances around a lot of themes (some of them developed better in Nicu’s half of We Come Apart), from first love to bullying, and the slight extent of the book leaves them seeming quite straightforward. Their various endings may have a general sense of lack of resolution, but such is life. Whilst there are no pretty bows to tie up any ends, we’re left with a sense of hope that things will ultimately turn out all right for Kasienka. This entry was posted in Reviews, YA fiction and tagged sarah crossan by Jonathan. Bookmark the permalink.